Public clouds and private clouds are data centers. What sets the public clouds apart is, that they are much more efficient than the private clouds currently living in enterprise data centers. The enterprise data center, specifically X86 servers, network, power and storage infrastructure is well understood and standardized, but has basically not evolved in a decade. Meanwhile public cloud vendors are innovating at industrial scale and pace, mainly behind closed doors. 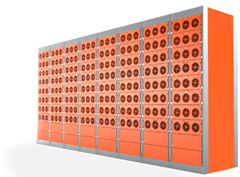 Our mission is to bring industrial efficiency to the enterprise data center through research and innovation. The traditional approach with processing, storage, networking, backup and cooling infrastructure built out in parallel, with very few sofware-based integration points is not efficient. Primarily because vertical scaling leads to an explosion in complexity. In order to scale the performance of data centers efficiently and predictably, our research and practical experiences points to many advantages to a modular, horizontal scale-out approach with homogeneous building blocks. 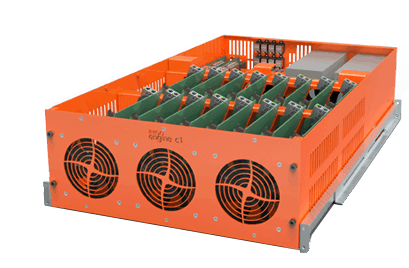 The Engine C2 is our next-generation building block which integrates high-density processing, storage, networking, backup and emergency power in one autonomous box. Virtually no extra complexity is added, by adding more boxes. Engine C2 will come pre-loaded with our cloud management stack, and build on our experiences with Engine C1. Engine C2 will be based on the Intel Xeon D family of CPU’s and will include integrated 10 Gbit/s networking with 2 built-in switches, 2 TB RAM, NVMe node storage and an array of SSD’s for shared storage. It will also include Li-ion batteries for backup emergency power. We think the Engine C2 has the potential do dramatically reduce server room complexity. The Engine C1 was a data center module for building next-gen modular data centers. The box integrated CPUs, storage, networking and backup. Engine C2 is in the works. It will be based on the Intel Xeon D family of CPU’s and integrated 10 Gbit/s networking. The Engine C2 is a self-contained box in its own right. It may however also be stacked with 10 Gbit/s interconnects in order to build out the capacity of your cloud, simply by adding boxes. Most enterprise data centers are heterogeneous collections of hardware, typically aquired over a number of years. This typically leads to an explosion in poorly integrated management tools. Our research indicate that the data centers operated by the large public clouds are more efficient than the typical enterprise data center by at least a factor of 4 on almost all important parameters. These data centers are much more homogeneous and much more efficiently managed, with large collections of similar hardware and a simple and focused management stack, typically developed in-house. We propose closing this gap, and have developed an integrated management stack, which comes pre-installed on the Engine C2. Multiple Engines may be managed by one management Engine. Multiple management Engines may be joined and managed from a consolidated interface as a single private cloud. For a decade Origo has been in charge of operating the server and storage infrastructure of one of the largest organizations in Denmark. This has given us hands-on experience with all ascpects of enterprise IT operations. We are used to the responsibilities associated with this, and we know how to run and support IT installations with tens of thousands of users, all in the context of ITIL, GDPR and ISAE 3402.